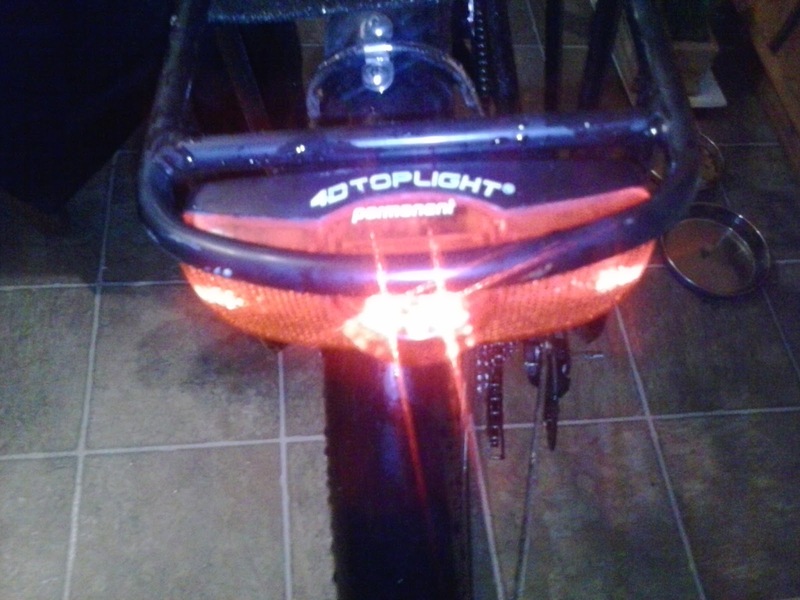 The Busch & Muller 4D Toplight is a good, bright, reliable tail light that mounts to a rear rack. They make a fancier one with a sensor so the light turns on when it's dark and off when it's light, but I've got the basic one with a good, simple switch. The light doesn't blink and the switch is a simple on/off toggle. 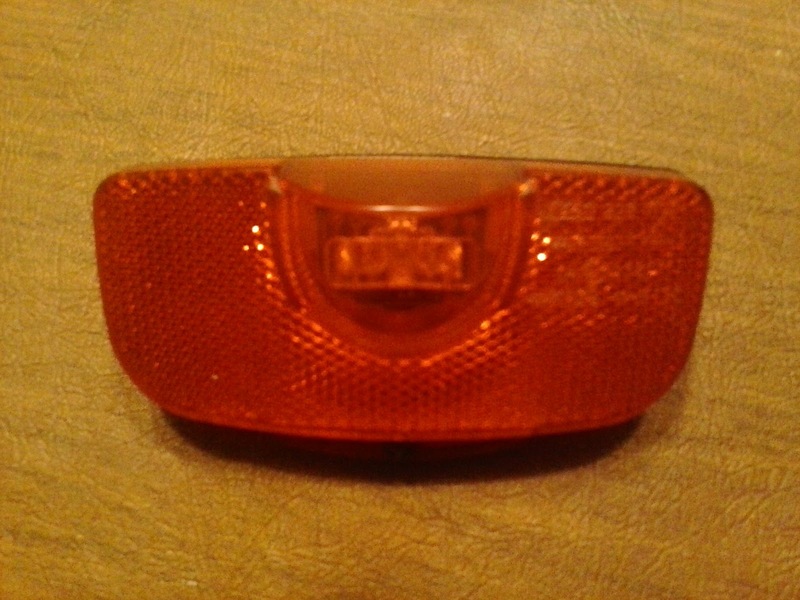 The light it bright with 2 very bright LEDs in the center and a couple of smaller ones on the outer edges. 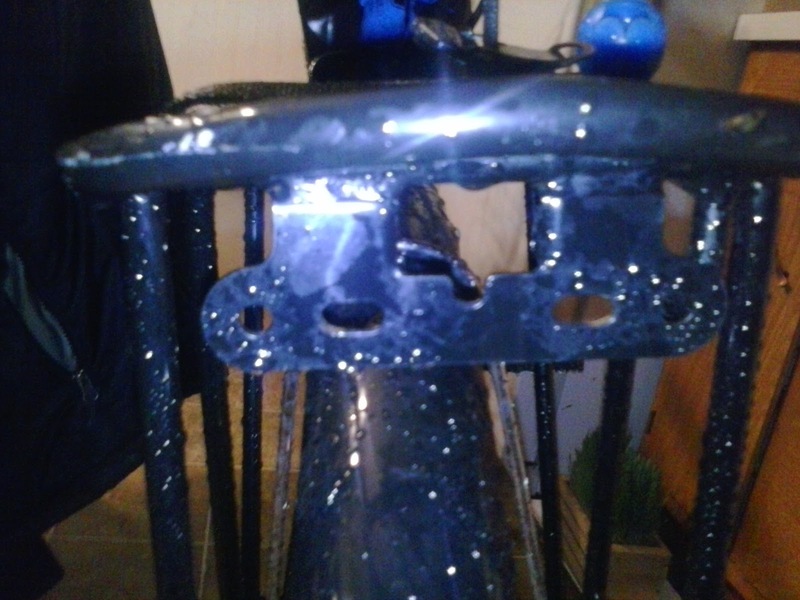 It bolts solidly onto the holes in the rack of my Allant or other European-styled racks like the Tubus. If your rack doesn't have such holes, you'll need an adapter. The light is powered by 2 AA cells, which power it for a hell of a long time. I haven't kept precise track but I run rechargeable NiMH batteries in mine and it can easily handle all night brevets or weeks of dark commuting. You will need a Philips screwdriver to change the batteries, which some folks find to be a hassle but I find to be much better than some of the cheap lights which just snap together & then snap apart when you hit a big bump. As you can see from the above flash picture, the bulk of the body of the light is a big, effective reflector. Peter White stocks the B&M lights and you can order direct or your local bike shop can get them from him. And like damn near everything these days, you can get it from Amazon. But speaking of Peter White, he's probably the best source of lights & light info in the bike world these days. Check out this page, for example. BTW, I get no kickback or deal from Peter White. 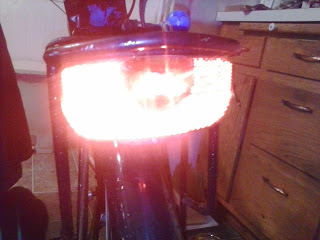 I've had the B&M light for a couple of years now (I had it on my Dahon for a while) and to tell you the truth I can't recall if I bought it from Peter or got it at a swap meet or what. But it's a good light. One other thing, various lights with electronic switches that toggle thru blinkie modes have an annoying tendency to freak out if they get water inside. Maybe the light turns on by itself or switches modes or won't turn off. I've never had that problem with my B&M Toplight. It's got a simple switch that is either on or off. It just works. And keeps working. I like that. 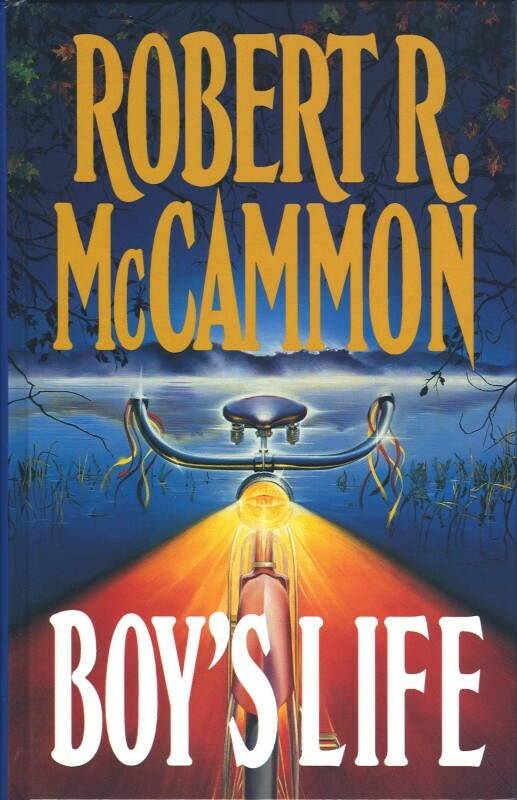 The only thing I want to do in this review is convince you to read Boy's Life by Robert McCammon. I want to do this because I love this book, I treasure it the way a twelve year old boy treasures his bicycle. Let's start there. I will not spoil the plot by telling you too much of the tale, the tale is Cory Mackenson's to tell. Cory is 12 year old in 1964 and lives in the small town of Zephyr, Alabama. Cory loves monster movies and mysteries, having adventures with his friends and telling stories. He tells amazing stories. Wonderful stories. But let's talk about that bike. Early in the book Cory's bike "dies" and if you don't understand how a bike can die then by gosh you need to read this book. And if you do understand that bikes live and die, then you might not need to read this book but you certainly should because this book is filled with wonders. Wonderful is a great word for this great book, because it is packed full of wonders. I thought about it. “Anything?” I asked. “That’d be fine,” I said. In later years I would think that no woman’s lips had ever been as red as that bike. No low-slung foreign sports car with wire wheels and purring engine would ever look as powerful or as capable as that bike. No chrome would ever gleam with such purity, like the silver moon on a summer’s night. It had a big round headlight and a horn with a rubber bulb, and its frame looked as strong and solid as the biceps of Hercules. But it looked fast, too; its handlebars sloped forward like an invitation to taste the wind, its black rubber pedals unscuffed by any foot before mine. Like a rocket, the bike sped me through the tree-shaded streets of my hometown, and as we carved the wind together I decided that would be its name. “Rocket,” I said, the word whirling away behind me in the slipstream. “That sound all right to you?” It didn’t throw me off. It didn’t veer for the nearest tree. I took that as a yes. “Yes ma’am,” I agreed. She knew Rocket, all right. There's much more in Zephyr than a boy and bicycle. There are ghosts and monsters, school and summer, friendships and adventures in the woods. There's light and darkness, great joy and sadness. I didn’t really want it, but I said, “Yes sir” to be polite. He wore a bemused expression, as if he knew my thoughts. A man named Ray Bradbury held such magic all of his life and wrote wonderful stories. In the pages of this novel, Cory's father gives him a collection of Bradbury's stories and it is, like the bicycle, a perfect gift. 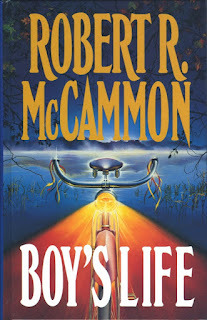 Robert McCammon has given us a similarly perfect gift, full of ghosts and monsters, mystery and love and the wonder of being twelve years old. It is called Boy's Life. It is one of the finest novels I have ever read. There are a lot of Kickstarter bike projects in the world these days, some good, some stupid, some somewhere in between. Fix It Sticks are one of the good ones. Brian Davis, the guy behind Fix It Sticks, sent me some early prototypes of his product. They work and they are clever. 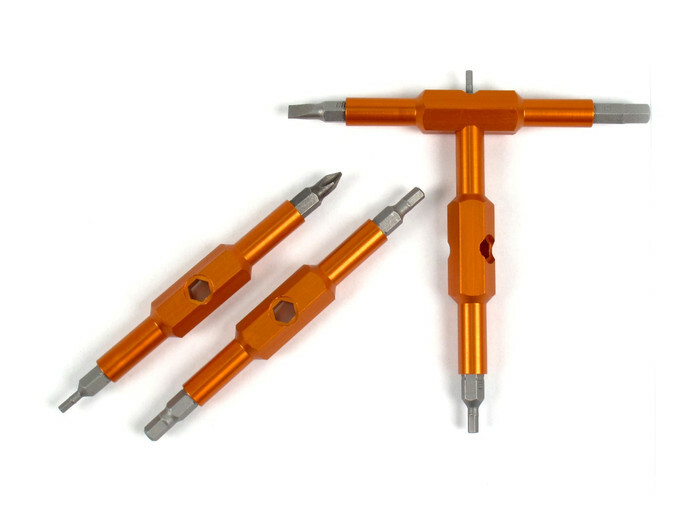 They can get into tight places, provide great leverage and are light and compact to carry. His current incarnations of the sticks are even better than the prototypes. He's already met and surpassed his initial Kickstarter goal and he's moving on to a full production run. Brian does a better job than I would in explaining Fix It Sticks, so click on this link and read about them and watch the video (the video is funny as well). There are still ten days to go in the Kickstarter and Brian has some more cool ideas that can make Fix It Sticks even better. Brian recently quit his day job to focus full time on Fix It Sticks. I like seeing someone with enough faith in their idea to make a big bet on it. Fix It Sticks are a bet worth making. 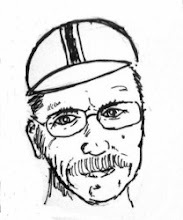 My basic rule here on Kent's Bike Blog is that I post bike stuff here when I have something to say. So, If Christine and I go off on tour or I have an interesting bike repair or some other bike topic comes to mind that I want to write about, I'll post it here. And, if I don't have anything new to report, I'll keep mum. But I do other stuff than bike and one of the things I do quite often is read books. Lots of books, all kinds of books, many of which have nothing to do with bicycles. My thoughts on some of those books, reviews, author profiles and stuff like that will get posted to my book blog which is unimaginatively called Kent's Book Blog. If that sounds like your kind of thing, bookmark it and I'll see you there. 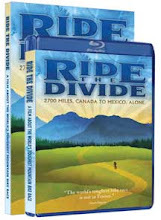 Books about bike stuff will get posted both here and on the book blog. I'll still keep posting bike posts here when I have something to say and damn near every day I'll have something to say on Twitter because that's where I just ramble on in 140 character bursts and do a whole lot of "hey look at that!' tweets.